Created in 2002 by the Dade Amateur Golf Association, the Florida Junior Golf Council was formed for the benefit of Florida's junior golf programs. Through the efforts of Charlie DeLucca, the founder of the Dade Amateur Golf Association, and golf advocates throughout the state, the "Golf Capital of the World" license plate was passed into law by the Florida legislature and Governor Jeb Bush. The revenue derived from the "golf license plate" is used to assist organizations in the State that offer instruction and playing opportunities in conjunction with education in golf's core values of integrity, honesty, personal responsibility and sportsmanship. 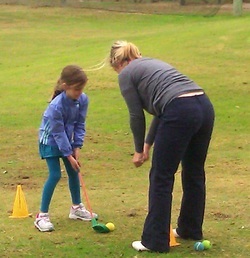 Funds are also used in support of junior golf initiatives serving the disadvantaged and disabled. The FJGC has a Board of golf advocates who oversee the grant process. This Board is actively assisted in its evaluation process by the Florida State Golf Association, a non-profit organization that has served as the governing body of the game in Florida since 1913. The Dade Amateur Golf Association was formed in 1968 to serve the golfers of Dade County Florida. Since that time, the organization has grown to be one of the most respected golf organizations in the country serving golfers of all ages. In 1982, the DAGA officials, with the support of the world famous Doral Golf Resort & Spa, began conducting an international junior golf tournament each December during the school holidays. Since that time, the Doral-Publix Junior Golf Classic has become internationally renowned and presently includes more than 650 players from around the world. The Dade Amateur Golf Association (DAGA) is internationally recognized as one of junior golf's strongest and most innovative supporters, raising funds to stage its many organized events through strong community support and various fund-raising activities. The organization conducts tournaments, golf camps, junior clinics and serve thousands of junior and adult golfers every year. In 2003, the Dade Amateur Golf Association joined The First Tee organization to expand its service to the game. The First Tee, is a division of the World Golf Foundation, has as its mission to impact the lives of young people around the world by creating affordable and accessible golf facilities to primarily serve those who have not previously had exposure to the game and its positive values. For more information please see: http://www.dagagolf.org. The Florida State Golf Association (FSGA) was formed in 1913 to preserve and protect the game of golf. The FSGA is a volunteer-based organization that includes over 800 member clubs and over 180,000 individual members from across the state. The FSGA provides a variety of services to its member clubs, their members and the general golfing community of Florida. The association conducts more than 250 tournament days each year, including 25 state championships and over 40 days of USGA qualifying events. 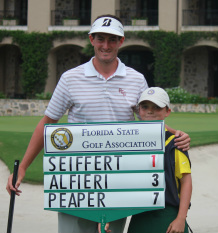 In 2004 the FSGA launched the Florida Junior Tour for the benefit of junior golfers throughout the state. The FJT organizes and conducts high-quality, affordable competitions for junior golfers in Florida. The tour continually emphasizes to the players the best values of the game including integrity, honesty and person responsibility. The junior golfers playing on the tour are some of the finest players in the country and the FJT serves as a proving ground for their future in the game. To find out more about the FJT, please visit the tour's website. For information on the FSGA please see www.fsga.org.